Teak wood homemade Attires, Affectionately Land of Phra Lo, Respectable Cho Hae, Well known peculiar Land, Gratifying Spirits Phrae people. The Temple of Bhrathat Chom Chaeng: Built on 1331 Buddhist Era, originally its mane was Pra That Chuan Chaeng cause Buddha wander till this hill at dawn. 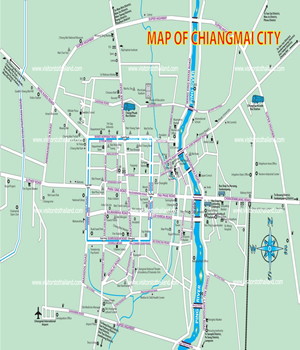 Later locals slightly distort pronunciation to Chom Chaeng. 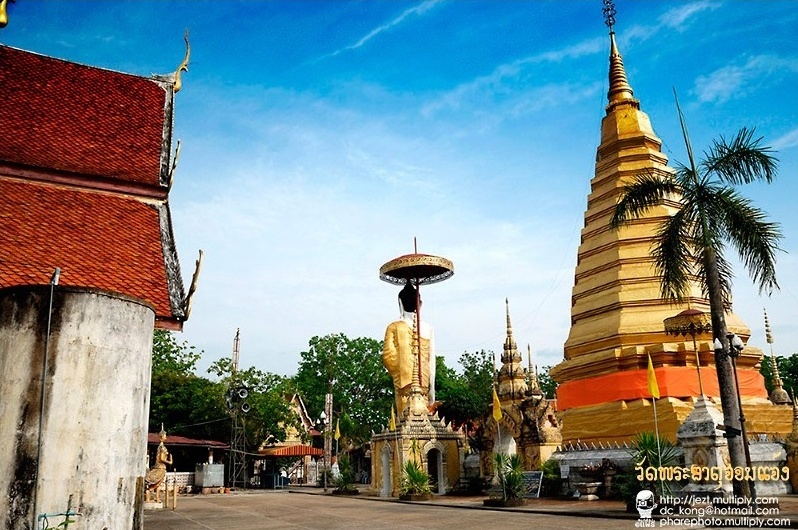 The pagoda is golden color, 29 meters high and the base is 10 meters wide. It is believed that in the stupa is placed Buddha's hairs. 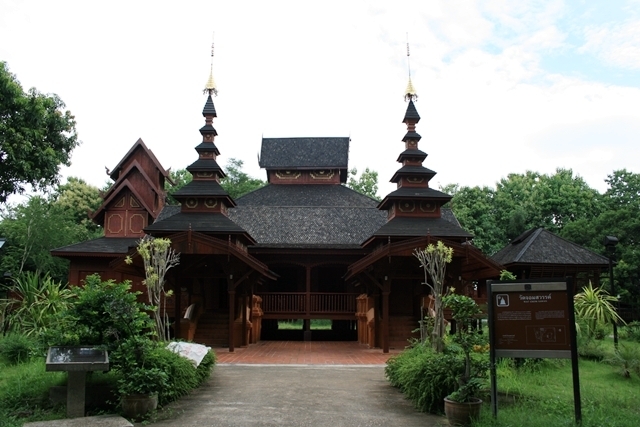 This temple has a pavilion called Pa Daeng sub district Museum or Museum of Province which collects the unseen ancient art objects. The Temple of Bhra That Cho Hae: Built on 19 Buddhist Era century in the king Lithai reign. Its name comes from the great silk which weaves from Sib Song Pan Na (near Mongolia). Locals get the silk to cover and worship the pagoda, importantly this pagoda own a "Tiger astrology"_ Thai calendar person's birthday. 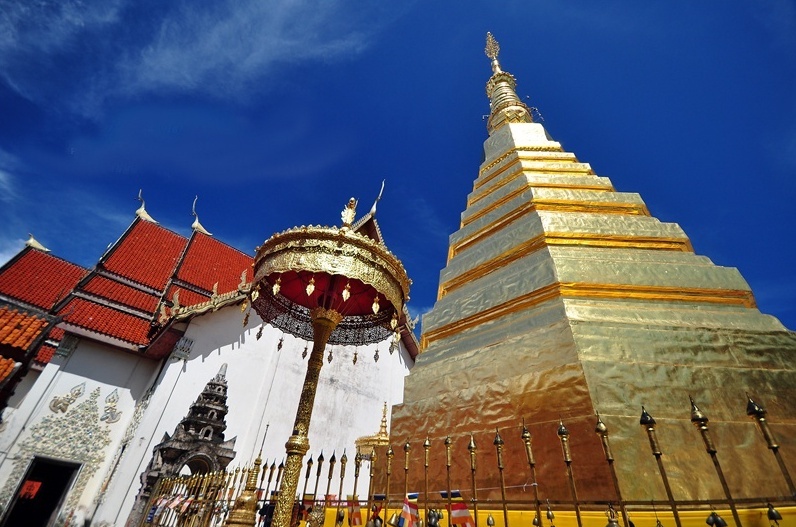 The pagoda is lined by gold, 33 meters high and shortened angles being Chiang Sean art. It keep the Buddha's hair in it. 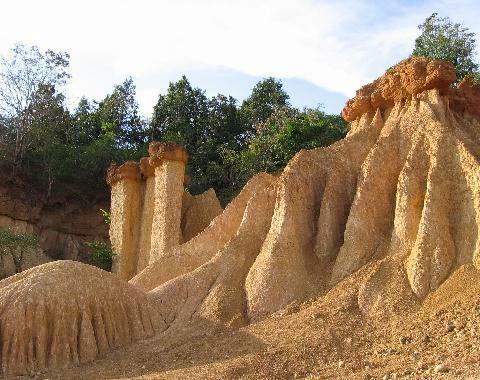 Situated at Pa Daeng sub district away from Phrae town approximately 9 kilometers. Pae Muang Pi National Park: announced to national park on 2524 Buddhist Era which covers the area about 800 hundred thousand sq. kilometers. Pae(แพะ) is dialect meaning a grove, Muang Pi (เมืองผี) translates lonely and silent. It occured from nature which altered earth covering and pulled down of ground; on the other hand, a hard one and stones are still remaining as same as mushroom trunk, and beautiful cliffs look same as rock column. Waiting visitors at Namcha sub district, journey the national high-way (Phrae-Nan). Wieng Go Sai National Park: Its geography is steep mountain and covers with a virgin forest, mixed woods which has many kinds of wild animals. It is source of many streams and gullies which has several large waterfalls. It covers the area about 410 sq. kilometers. Standing out away from Phrae town just 79 kilometers going on the national high-way # 101.